TORONTO is the capital city of a vast land mass known as the Province of Ontario. 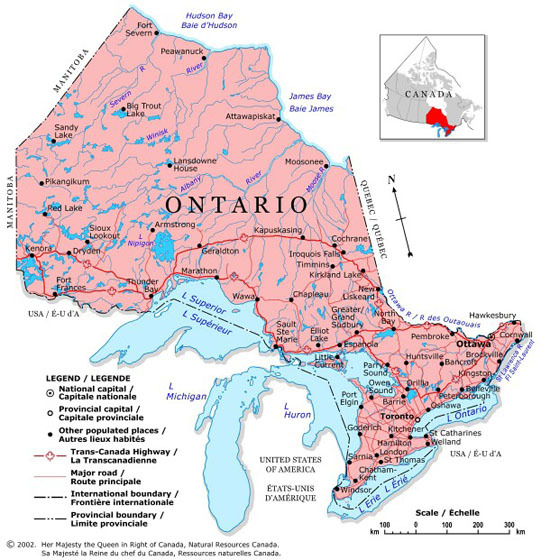 Second largest province in Canada, ONTARIO covers an area of 415,000 square miles (or 1 million square kilometres), population 12 million. By comparison, TEXAS (area 269,000 square miles or 696,000 square kilometres), population 27 milion. To drive from east to west in the province takes the better part of 2 days. At the top end of Ontario, just below the Arctic tundra line, on James Bay, you’ll come to MOOSE FACTORY, 850 kilometres north of TORONTO. There’s no road access to Moose Factory. To get there you must travel to COCHRANE, then take a five hour train ride to MOOSONEE, and from there board a boat, helicopter or water taxi. CHRISTOPHER MANSON (Documentary Media MFA/2011), winner of Ryerson University Magazine’s photo competition, visited Moose Factory last summer. He was working on a project documenting the rise of Type 2 Diabetes in the area. <PHOTOS BELOW – 1) overhead utility pipes provide steam heat – cannot be buried because of permafrost; 2) Teepees are sometimes used as garages and storage facilities for aboriginal families. This entry was posted in Other cities and tagged Canada, Christopher Manson, Moose Factory, Ontario, Ryerson University, Toronto. Bookmark the permalink. ← Too much progress? BEIJING’s Air Quality Index rockets to 755!